Shoulder arthroscopy is used to diagnose certain injuries, such as damage to the rotator cuff (the muscles and tendons surrounding the shoulder), damaged cartilage, and damaged or broken bones, bone spurs, shoulder instability, shoulder impingement syndrome, or arthritis. Depending upon what he finds during the procedure, the surgeon may choose to complete any necessary repairs during the arthroscopy. This repair may require the insertion of other instruments through additional incisions. For instance, torn muscles or tendons may be fixed, bones may be shaved, or damaged tissue removed to resolve whatever issue is creating pain or immobility in the shoulder. 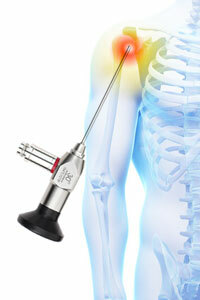 You may require more major surgery if the damage the surgeon sees is too extensive to repair during the arthroscopy.